Good blades on a saw are analogous to good tires on a high performance car…they can ultimately determine or limit the resulting end performance. 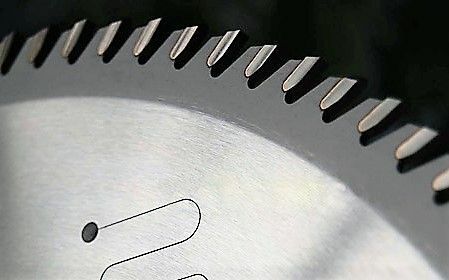 There are a number of different factors that should be considered in saw blade selection. Decent quality is essential or you’re sunk from the beginning, so skip the cheapos even if they’re a “good deal”. 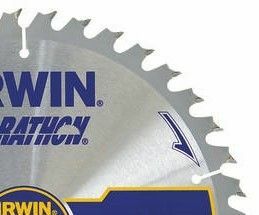 Two inferior saw blades that cost the same as one decent saw blade are still inferior. It’s sort of like having two pens that don’t write well. What’s the point? All blades are not created equal….better carbide, better brazing, better steel, better tensioning, better balance, better geometry, and better precision all contribute to better performance. Chances are good that you’ve invested a fair chunk money in your saw, and even if you haven’t…a good blade will still optimize the performance, and maximize the return on that investment. You don’t have to spend big bucks to get a good blade, but higher priced blades typically increase your chances of getting a good one. The more you know, the better the chance of finding the best blade at the best price. As with many things, there are often a variety of choices that each have merit, so consider what’s best for your situation. Hobbyists and professionals tend to have very different expectations for their blades….a blade that’s perfect for someone else’s circumstances might not be right for you. If all else is equal, more teeth tends to equate to a cleaner cut, but with more resistance, more heat, more chance of burning. If all else is equal, fewer teeth tends to equate to a faster cut, with less resistance, less burning, but a rougher finish. Neither extreme or design parameter is ideal for all situations, and neither extreme or paremeter is “better” in all situations…they’re just better suited for different applications. There are pros and cons with every design parameter, and we’ll try to touch on those in each segment here. Choosing the correct combination of parameters and compromises for your application is the key to success. Blade selection is very much proprietary to your saw and what you cut. One of the early decisions should be to choose which types of blades are best for your situation. You can choose separate task specific blades that give excellent results in a narrow operating range, or a general purpose blade that will give good results in most applications, but will excel at none. You can also choose a variation that combines both philosophies. These all have merit depending on your situation, preference, budget, and cutting objectives. For example, a decent purebred task specific 60-80 tooth crosscut blade will certainly make “cleaner” crosscuts than a 30, 40 or 50 tooth general purpose blade of comparable quality, but offers less versatility and increased burning. At the other end of the spectrum, a 24 tooth bulk rip blade will certainly be more efficient at ripping thick material with less burning than a crosscut or general purpose (GP) style blade, but will have a rougher cut and won’t be good at most other tasks. There are downsides to each type. The key to “better” depends on how you define the term. Better performance in one aspect of cutting doesn’t necessarily mean it’s a better choice overall, so consider all the factors before making a decision. Taking the approach of using task specific blades requires owning at least two blades that each excel in a limited operating region, and are typically unacceptable for tasks outside of their intended scope. These blades should achieve the optimum possible results when used within their intended usage range. They also require blade changes for each different task for optimum results. Two task-specific blades (typically a 24T ripper and a 60T or 80T crosscutter) will generally stay sharp longer than a single general purpose blade because they share the work load, but will cost more upfront and will also cost more to re-sharpen when the time comes. A general purpose blade will neither rip as efficiently as a true rip blade nor crosscut as cleanly as a dedicated crosscut blade, but you may find that it’s more than acceptable at doing both tasks for most situations. A valid argument in favor of using one high quality general purpose blade is that the GP blade leaves a cleaner edge than the rip blade, crosscuts faster than a crosscut blade, and does so with the convenience and cost of using one blade. Most higher quality general purpose blades will leave a glue ready edge, which is often as good as it needs to be. If you want the absolute best performance possible from your saw, look to high quality task specific blades. If you happen to do a lot of specialty cutting of fine veneered plywoods, veneers, melamine, MDF, plastics, etc., a blade made specifically for those materials is definitely recommended. If you tend to rip very thick dense materials regularly, then a dedicated bulk ripping blade is a wise choice for you right from the start. Sooner a later a decent general purpose blade will be useful, so if you’re not certain what to get it’s always a reasonable starting point IMO, even if you pursue separate dedicated blades later. Regardless of the approach you choose, buy quality blades. So you’ve decided to start with a single all purpose blade, but you discover that 40T ATB general purpose blades and 50T ATB/R combo blades both cover essentially the same cutting range. Which is better? Unfortunately, there’s no simple answer that’s absolutely true for all situations. Not only does it depend, but it’s somewhat subjective too. Each blade is unique, so there are many exceptions when trying to generalize. Overall I’ve noted that the premium 40T general purpose blades (Infinity Super General, Freud Fusion, Forrest WWII, Tenryu Gold Medal, Ridge Carbide TS2000, etc.) tend to leave a more polished edge, while the top 50T ATB/R combo blades (Freud LU83/84, Tenryu RS25550, Infinity Combomax, DeWalt/Delta 7640, Amana Tool 610504, Irwin Marples, CMT 215.050.10/216.050.10, DW7150PT, etc.) tend to leave slightly more pronounced swirl marks on the edges. So, while the premium 40T blades tend to have a performance advantage in cut quality due in part to their very tight side clearance, that same trait also tends to make them fussier about setup and technique, and can be slightly more prone to burning in some materials, while the 50T ATB/R blades tend to be easier to get good results with. If you’re meticulous about setting up your saw and want the best possible cut from one blade, the premium 40T blades could offer a slight advantage for you. If you’re less experienced with TS setup, or don’t like to tweak the saw much and just want a good “set it and forget it” blade, the 50T ATB/R blades seem to be more forgiving in my experience. Remember…this is just subjective opinion based on the blades I’ve tried. 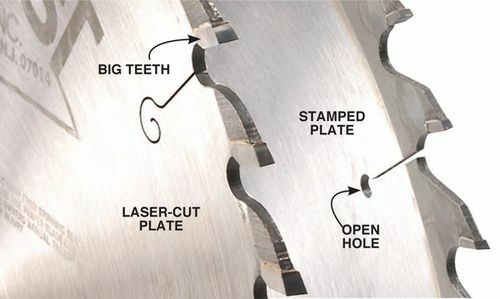 Crosscut blades use design parameters that are optimized for fine cuts across the grain of hard and soft woods, but the high tooth count can make them more prone to burning, so are not recommended for most rip cuts…particularly in thicker materials. The same parameters also make many crosscut blades suitable for lower volume cutting in plywood, veneers, and melamine. Most fine crosscut blades combine a high tooth count (usually between 60T and 80T for a 10” diameter blade) with an ATB or Hi-ATB grind that excels at shearing across wood fibers, with a low to medium hook angle. The resulting cut is smoother and slower than most other types of blades. It’s not uncommon to find crosscut blades for miter saws that feature a combination of ATB and FTG teeth for increased efficiency and edge life. If all else is equal, the steeper the top bevel, the lower the resulting tear out there will be, but note that it comes at the expense of edge life, due to the pointy tips of a Hi-ATB grind being weaker than the tips of other grinds. More teeth tends to equate to a cleaner cut too, but comes at the price of more heat and resistance. Generally 60T to 80T is the sweet spot for cut quality and efficiency of cut for cross grain applications. Some 100T+ crosscut blades do exist, but my experience has been that the added resistance isn’t worth whatever benefits they offer, with the possible exception of cutting veneers or very thin plywood. There are also some crosscut/ply/laminate/melamine blades that feature a triple chip grind (TCG). TCG blades tend to have excellent wear characteristics, but not necessarily the cleanest of cuts….they’re ideal for high volume applications where edge life is a concern, and for very brittle and abrasive materials (melamine, MDF, teak, pressboard, etc) that tend to cause the tips of an ATB or Hi-ATB blade to abrade more quickly than other grind types. An 80T Hi-ATB will be among the cleanest cutting blades on the market, but will have somewhat shorter edge life than a comparable ATB or TCG blade. Depending on your volumes and cleaning habits, most hobbyists should still get very reasonable edge life from a top shelf Hi-ATB blade. Rip blades tend to be the polar opposites of crosscut blades. Their parameters are optimized for clearing the longer fibers of rip cuts with the grain where tear out isn’t much of a concern, along with less burning in thicker or burn-prone materials like cherry or maple. Bulk rippers tend to use a flat top grind (FTG), low tooth count (10T-24T), and a steep hook angle often near 20° that’s ideal for efficient ripping, but would leave unacceptable tear out in most crosscuts. There are also rip blades with a moderate top bevel ATB grind. The resulting cut is quick and efficient, posing less resistance to the saw than higher tooth count blades, and a somewhat rougher cut. The better examples of the more common 24T FTG rippers are capable of glue line edges given flat straight stock and a well tuned saw. They’re easier to spin in thick materials, so put less strain on your saw than higher tooth count blades. There is also a subgroup of rip blades known as “Glue Line Rip” blades…that term can be defined in many ways and is a common marketing phrase, but the most common is found in a 30T configuration with a triple chip grind (TCG) and a moderate hook angle of 12-13°. Since they feature very tight side geometries to provide a highly polished edge, their ability to rip thicker materials is generally limited compared to a standard 24T FTG ripper. The niche of most of these “GLR” blades is smoother rip cuts in materials up to about an inch thick…if you choose a 30T GLR ripper, you will likely still want a bulk 24T FTG rip blade for thicker stock. Many blades are capable of a glue ready edge….you don’t need to buy a blade that claims “glue line ready” for the blade to be actually capable of it. It’s also important to recognize that no saw blade can replace the function of a jointer…a clean edge doesn’t flatten the face of a board or provide a reference edge, and is only one part of a larger equation of cutting stock. Flat straight stock to start with is an essential part of getting clean glue ready cuts, and ensuring a uniform 90° edge to the face. Breaking from convention, it’s also possible to choose separate blades that offer different regions of excellence than the conventional dedicated 24T bulk ripper and 80T fine crosscut blade, that can still be used in a “hybrid general purpose” manner. Even though the majority of general purpose/combination blades have 40T or 50T, there are some blades with 30T ATB and 60T ATB or Hi-ATB grinds that can each be used in a somewhat limited general purpose capacity. Though typically considered a “rip blade” and a “crosscut blade” respectively, each offers more versatility than a traditional 24T and 80T task specific blade, while still offering some excellence in a specific cutting task, but to a somewhat lesser degree. They create an “either/or” scenario, and can reduce blade changes while offering superior performance compared to a 40T or 50T blade. Of course, it’s very dependent on what you cut. A 30T blade with an ATB grind and a steep positive hook angle (like the Forrest 30T WWII, DeWalt DW7653, Amana Tool 610300, or Tenryu IW-25530D1… (not to be confused with the 30T TCG GLRs from Freud and CMT) will rip more efficiently than comparably designed 40T general purpose blades in thicker materials (even beyond 2” given ample power and the right circumstances), will make cleaner rips than a standard 24T ripper…it may even crosscut acceptably well in some situations (it’s subjective). The weakness of the 30T blade is that it’ll have more tearout for fine crosscut or fine plywood type duties, but it will give “glue line” rips and more versatility than a standard 24T ripper, which potentially means fewer blade changes and acceptable performance in a wider region. A good blade of this type will be suitable for wide range of tasks that don’t require ultra fine finish cuts….the finer the finish requirement, the less desirable this blade becomes. Conversely, a good quality 60T ATB or Hi-ATB blade with a positive hook angle (like the Forrest WWI, Infinity 010-060, or Freud LU88) will make cleaner rips in thicknesses upwards of 5/4”, and will make cleaner crosscuts and ply cuts than a conventional 40T ATB general purpose or 50T ATB/R combo blade, so is a good choice where cleaner cuts and lower ripping efficiency are suitable. The weakness of the 60T blade will be loss of efficiency in thicker ripping, and having more tendency for bogging of the saw and burning in thicker materials. The combination of the 30T and 60T blades teamed together offers increased range over a standard 40T or 50T GP blade, better versatility than standard 24T and 80T separates individually, and longer edge life between sharpenings than a single blade. Depending on your situation, a good 30T or 60T blade may be suitable as the only blade you’ll need, but the two blades combined as a set will “tag-team” to cover a very wide range of tasks extremely well. The best part is that either can still be left on the saw with less urgency for blade changes for most tasks….sort of a “best of both worlds” scenario if you’re willing to pop for two blades. As with many choices, it’ll boil down to a matter of preference and your particular situation, but I’ll try to explain the logic of both philosophies. To some folks, it’s just a matter of the math being simpler with a 1/8” blade than a 3/32” blade. It can also be a matter of not knowing any better, or what was available on sale at the time of purchase (BTDT!). Both kerf widths will work with most saws, but note that changing kerf width can skew the zero reference on the measuring tape on a left tilt saw, so you’ll need to address that if you change widths. Even though the width differences appear very small, a full kerf blade is typically 33% wider than it’s TK counterpart. A wider kerf blade makes a wider cut, thus taking more wood and requiring more power to make the cut at the same speed…a similar principle to a lawn mower’s width of cut. There will also be a proportionately higher amount of sawdust with a full kerf blade, more wood consumed in the process, and even somewhat higher noise levels. Wood savings can be a consideration, though a minor one for most hobbyists. That consideration may become more significant if you handle a lot of expensive wood. You’re likely to encounter situations where a full kerf blade will bog a smaller saw more easily than a TK would, most notably in thicker materials. The wider the kerf, the more power required to pass the blade through the material. Slowing down the feed rate can help compensate somewhat for the additional power requirements, but slower cutting means more of a tendency to burn the wood, and less efficient cutting in thick materials. Full kerf blades tend to be more stable than their TK counterparts due to the increased steel thickness and body mass, but require more power to spin. The heavier mass of a full kerf plate will handle the stresses of heat better than a TK blade, so is often a more suitable choice for high volume applications. If you’re using a saw that’s under 3hp, a TK blade will pose less resistance to your saw, making it easier to feed material through the blade. A high quality thin kerf blade with proper tensioning of the body during manufacturing will rival the cut quality and performance of a high quality full kerf blade, and can be a very suitable choice for a home shop, smaller saws, and even in many commercial settings where wood consumption is a concern. Which width to choose depends a lot of your saw and the material being cut. Your splitter or riving knife width should also be part of the consideration. Choosing a blade that’s thinner than the splitter blade can cause the board to stop mid cut if the board binds on the splitter. This is a fairly serious concern, and is one of the reasons I often caution about choosing 7-1/4 inch blades for use on a 10 inch saw. There are valid arguments for both kerf widths, and the choice will come down to your personal preference and circumstances. To further complicate blade selection, it’s not as simple as just buying a reputable brand name blade either. Many brands have multiple lines aimed at different market niches that are each made to different price points and different objectives. Always focus on the blade, not the brand when you’re researching! 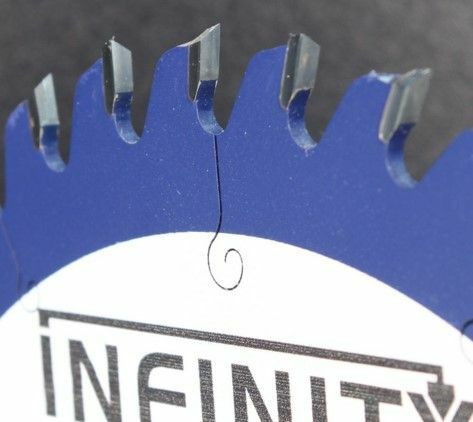 Brands like Infinity, Forrest, and Ridge Carbide only offer a single line of premium blades with a variety of models for different applications within that line. Companies like Freud, CMT, Amana, Tenryu, Leitz, Delta, DeWalt, Bosch, Irwin, and Systimatic offer multiple lines often with different intended applications. Some of those blades are premium quality that will rival the performance of Forrest, Infinity, and Ridge Carbide, but some will not so you can’t just select a brand and be confident you’ve got a blade that’s representative of their best blade(s) for fine woodworking uses. While not all are at the “premium” level, you’ll be hard pressed to find a clunker from companies like Freud, CMT, Amana, Systimatic, or Tenryu….just be certain that you’ve chosen a blade that’s appropriate for an intended application and you’re likely to have very good success with it. Companies like DeWalt, Oldham, Bosch, Irwin, and Delta have some great blades too, but they also have some mediocre blades at the entry level that I prefer to avoid. Don’t dismiss the excellent blades because of the lesser blades of the same name. Learn as much as you can about a blade’s tooth configuration and geometry, and know what series or line the model comes from. Trying to decipher the hierarchy within a brand can be a challenge, but some of the basic clues are things like the price, fit & finish, carbide thickness, packaging, features, and even the labels and descriptors the manufacturer uses can help. Terms such as Premium, Professional, Woodworker, or Industrial tend to indicate higher quality levels than those labeled Construction, Contractor, Value, Bulk Pack, or Economy, though be on the look out for companies who use the premium terms strictly as a sales gimmick without backing the title with improved quality. Look to see if the plate has fine laser cut expansion slots versus those that are from a cheap stamped steel plate. Large shiny carbide is certainly no guarantee of quality either, but it does indicate that they’re not trying to take the cheapest route. Sloppy brazing doesn’t necessarily impact cut quality, but it can suggest that some corners were cut. Painted carbide tips tend to suggest an effort to disguise tiny carbide teeth, as well as an effort to eliminate a manufacturing step. Country of origin can also be an indicator but it’s far from a guarantee of quality…however, if a company produces top notch blades made in the USA, Germany, Japan, Israel, England, Canada, the European Union, or Italy, the odds are good that their Chinese imports are not their best line. There are some really good Chinese-made blades, but most brands move manufacturing to China to cut costs, not to improve quality. Also consider the retail circumstances. In general, woodworking specialty stores tend to carry higher end lines than most homecenters, but there are always exceptions. So how do you know a good blade from a bad blade without trying them? You don’t really, but there are some visual clues to help….compare the pics below and note the contrasts between the first two pics and the last two pics….look at the carbide size, brazing, fit and finish, expansion slots, plate thickness, etc. The better blades tend to have much larger and more highly polished carbide, as well as neater brazing, and computer controlled laser cut bodies and expansion slots (top 2 pics), vs the tiny carbide and sloppy brazing of a cheaper blade with a stamped steel body and expansion slots (bottom 2 pics). None of these factors ensures better cut quality, but it’s a strong indicator that care was taken when the blade was designed and manufactured. It’s a myth….”magic dust” doesn’t exist in the saw blade world, so don’t be sucked in by marketing ploys and exaggerated claims. The technology is advancing all the time, but we’re not talking about break through nano technology here….it ain’t rocket science! It is important to have some good in-house engineering expertise, but in this day and age the technology and top materials to make a good blade are readily available to just about any venture capitalist who wants to give it go. It costs more to make good blades, and it limits the potential market. It’s the commitment to quality and the choice to utilize that technology that separates the contenders from the pretenders. No single manufacturer has a significant advantage in the “special” carbide they choose, the top grade steel, or secret grind angles. It’s all available to anyone who knows it exists, and chooses to pay for it. Don’t get so married to a single manufacturer that you can no longer be objective about who they are and aren’t. Always analyze the blade itself, not the logo, not the reputation, not what was true 20 years ago, and not their marketing hype. As an example, in years past you may have heard good things about the Oldham brand saw blades….their former “Signature” series, made in the USA was excellent. That same brand is now mainly made in China, and are cheap entry level blades that are fairly comparable to the stock blades that come on most saws. I’m not trying to pick on Oldham here, but it’s a really good example of brand names, quality, and change…..make no mistake, they’re all in it for the money! Another similar example of brand decay are the current Avanti and Avanti Pro lines at Home Depot….the Freud Avanti series was once a very good example of great bang for the buck, similar to the Diablo line. Note that Freud ceased manufacturing the Avanti line in June 2009….what is now sold under the “Avanti” logo are very mediocre cheaply made blades that aren’t made by Freud, and aren’t well suited for fine woodworking IMHO. As another example in the opposite direction, for many years Irwin had a reputation for making lower grade entry level construction duty blades that weren’t really great for fine woodworking…the “Marathon” and “Classic” series to be specific. In the past couple of years, Irwin has reintroduced a very good line of thin kerf blades made in Italy under the “Marples Woodworking Series” that offers what I feel is a good value in lower cost blades…IMO they go head to head with the popular Freud Diablo series. In a nut shell….know what you’re buying! 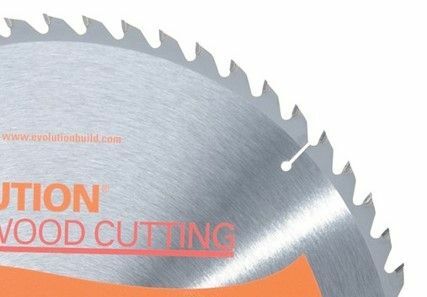 It’s important to acknowledge that a saw blade is only one component of a more complex cutting system and sequence of events that occurs during cutting. The blade is only one possible variable if cutting results aren’t up to expectations. Proper blade-to-fence alignment is one of the most important steps in setting up your saw. Also, your table saw needs a good throat insert to perform well. A great blade will cut poorly if the throat insert is flexing or isn’t flush and level with the top causing the wood to catch. A zero clearance insert will help improve cut quality…make sure it’s stiff, flat, and flush. The table needs to be reasonably flat too but it typically takes a large deviation to noticeably affect the cut, and is a difficult problem to resolve if one exists. A splitter or riving knife is a recommended safety device…be sure they’re aligned with the blade too. While you’re looking your saw over, check your arbor and arbor flange for runout. If the arbor wobbles even a little, the saw can vibrate excessively and the blade won’t cut well. Pulleys and belts can impact the arbor’s ability to run true so check them too. An improperly tuned saw won’t run well, and will mask the performance of a good blade. (Makes you wonder how many times a premium blade was deemed no better than a modest blade because the saw wasn’t capable of revealing the differences of the better blade…). Most saws (likely all) spin in a self-tightening rotational direction. The arbor nut only needs to be snug to start….hand snug, followed by a light partial turn with a wrench. If you over tighten it, you risk bending the blade and diminishing its potential cut performance. To give the blade and the saw a fighting chance at perfection, the material being cut should be flat and straight. A flat straight work piece stands a much greater chance of being cut smoothly and accurately than a work piece that’s rocking, twisting, and/or pulling away from the blade. And finally, if you can’t remember the last time you cleaned your current blade, go take it off the saw, spray it with household degreaser (409, Greased Lightning, Fantastic, Goo Gone, Simple Green, etc. ), and hit it with a toothbrush or brass bristle brush to clean it up! (5 minutes from start to finish). If it’s really grungy, and you happen to have some kerosene on hand, give it a good overnight soak. A dirty blade cuts like a dull blade, creates excess heat and resistance to the saw, leaves burn marks, and eventually causes it to become a dull blade prematurely. Clean your blade(s) often and they’ll perform like new for a much longer time (note the emphasis!). Tooth count is one of the more important considerations of a saw blade. Number of teeth should be based on the intended application along with the other design parameters of the blade. If all other parameters are equal, more teeth will equate to a cleaner cut, but the equation is more complex than that. There are several other factors that influence cutting performance in addition to tooth count, and more teeth is not always better. More teeth also means more resistance to the saw, slower feed rates, more friction & heat, and a higher chance of burning. Fewer teeth equates to a faster more efficient cut, but typically also means a rougher cut. Depending on thickness, it’s recommended to have 5 to 7 teeth in the material for crosscutting and finish cuts in hard wood, and 3 to 5 teeth for ripping operations. 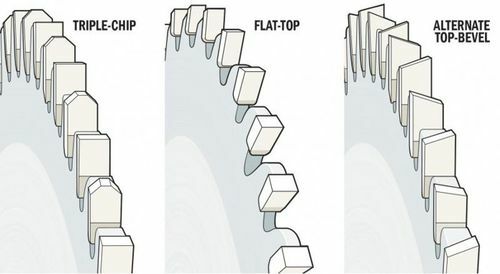 Depending on blade diameter, it’s common to see between 10 and 30 teeth on a specialized ripping blade, and 60 to 100 teeth for crosscut blades and blades used for plywood, veneers, melamine. laminates, and other sheet goods. Note that more teeth cost more to make, more to buy, and more to sharpen when the time comes, but more teeth also tend to hold an edge longer because they share the work load. I’m putting it in my refereces . Thanks for the well writen blog! Scott, thanks for the blog. It is well written and informative. I certainly learned a great deal from it. Let me ask you this on the subject of thin kerf/blade deflection…I was recently ripping some 1 1/2” hard maple pieces on my new unisaw with my 3/32 thin kerf Forrest WW2 40t ATB blade. I was making an end grain checkerboard style cutting board. After I did a glue up and cut the blank and started flipping pieces I noticed my lines weren’t matching up. When I looked closer it seemed like the cuts were angled slightly. I dialed the saw in before I started working and everything from the fence to the blade was dead on straight and parallel. The arbor has no play or run out in it..its practically brand new. I was using the blade without the recommended stiffener plate. Do you think the blade could have deflected slightly to throw off my square cuts? If it’s not that then maybe I was thinking I clamped things too tight….I’m not sure whats going on. Any thoughts? David – Were you just trimming an edge off…as in, were both sides of the blade buried in the workpiece or was one edge exposed? That type of situation could certainly lead to some deflection. My thinking is that it generally takes lateral pressure to cause deflection. Also, 40 teeth in 1-1/2” hard maple is pushing the limits of the blade, meaning more heat and complications from that. What kind of throat insert were you using? Well I was getting a little burning..probubly like you said..I should have been using a 30T blade…so I was cutting over and then doing a cleanup cut…so I guess it was both..blade buried and then the cleanup cut. I was using a zero clearance insert..commercially made phenolic. The blade as far as I can tell is flat….when I check it on my saw top. I think I am going to invest in a 40T ATB WW2 and a 30T ATB ww2 both full 1/8” kerf. Then I will get this blade sharpened and then hang it on the wall…. Scott, thank you for taking the time to write this. Didn’t read it in its entirety now (late, too tired at the moment) but it’s in my Favorites and when I’m looking for a blade I’ll be here reading it first. Knotscott never disappoints. A fantastic reference for all things tablesaw blade. Thanks Scott! Thank you for sharing this. Along with the many things I learned from www.bandsawblog.com regarding band saw machine and band saw blade basics, I sure will remember what I got from this article. Please keep sharing important articles like this. Very nice article. Favorited for scouring more later. Very nice, I will also have this favorited, lots of useful information. Thanks! @knotscott— Very well done treatise on table saw blade selection. I am shopping now for a combination blade for my Craftsman table saw, and I will use your posting as a reference. I am looking at a standard kerf Freud 40T or 50T combination blade. I am almost done with the operational issues so I am on to getting a new blade and fence. Have you ever thought of setting up a Spreadsheet shoing all of the various blades and their properties? ... while you’re at it, you could assign values to the different properties and insert them instead of symbols, etc.